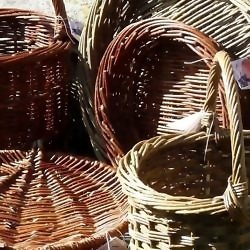 I am a part time basketmaker, making functional willow baskets for use in the home and garden in the traditional style. I use willow grown and harvested on my smallholding in Argyll, supplemented with willow from Somerset. Each basket is unique and all are handmade by myself. Visitors to the workshop welcome but please contact first to make sure I am here.